UMCOR Supply Kits help to care for the most vulnerable people during times of crisis. They also help to sustain everyday life by providing basic necessities to people who lack ready access to essential supplies. These kits provide vital support for the work UMCOR does throughout the world. By donating kit supplies or financial gifts to purchase the supplies, you make a direct, tangible difference in sustaining people’s lives. Each Kit page contains lists of specific items needed, the estimated value of each kit, the cost for processing and shipping the kit, shipping instructions, and contact information. Gathering and assembling supply kit materials as a group can be a wonderful hands-on activity, bringing together young and old, neighbors, friends, and co-workers. 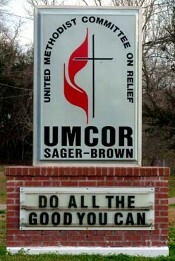 UMCOR asks for and deeply appreciates your support.